When his hands closed around her neck, Monet Cullins made a decision: it was the last time her boyfriend would hurt her. That was in Houston in 2015. Feeling called to move to North Texas, Cullins packed up her three daughters. She found a safe place at SafeHaven of Tarrant County, which provides assistance to families healing from domestic violence. For Cullins, that meant two things: returning to school and launching a business. She had studied criminal justice at Houston Community College. Now she felt a different calling—starting her own cosmetics line. That self-esteem problem was rooted in her lips. Cullins felt they were too big for her face, and she constantly tried to hide them beneath pale lip colors. After escaping an abusive home life, Cullins had a new mantra: embrace your insecurities. While living at the shelter, she launched her business, Bold Lips Revolution. She saved her money, found a manufacturer and created a website. But she knew to be truly successful, she needed to finish her education. In 2016, Cullins began studying business at TCC. She learned business principles and networked with contacts in the community. With the help of her mentor and professors, Cullins developed a real business plan. She will also soon be a graduate, earning her associate’s degree in May. Cullins is already looking toward the future, with plans to go on to earn her bachelor’s degree as well as an MBA. 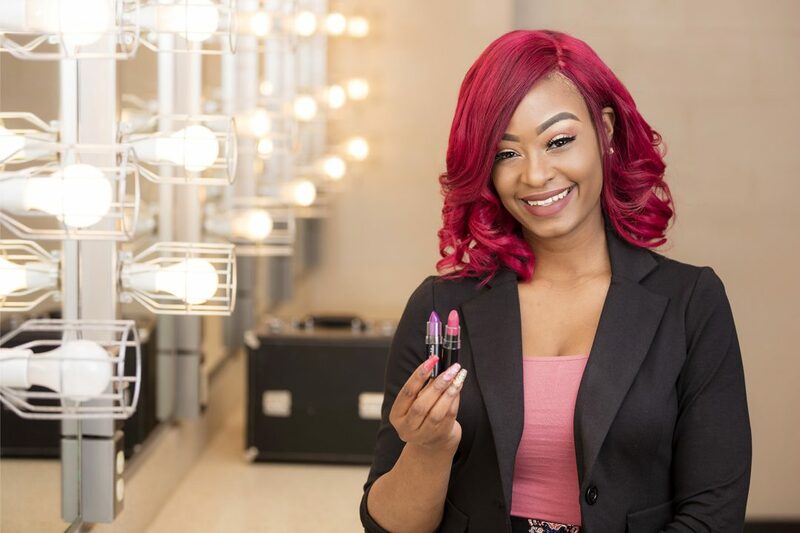 Her business is growing, averaging 10 to 15 orders a month, and her lip colors have already been on models in New York and Miami Fashion Week shows. She credits her success to her education at TCC. In addition to learning how to operate a business, as a student, Cullins learned to juggle competing priorities. Proffitt says the key to Cullins’ success is that her plans are more than abstract. “Other students can learn that it is important to have dreams but imperative to express them in a written vision, with goals and strategies for achieving them,” said Proffitt. Next up for Cullins is her Ruby Kisses collection with 10 new colors. All orders come with a personalized note, and a portion of her proceeds go to SafeHaven of Tarrant County. Cullins wants others to know that her business is about much more than makeup. Visit BoldLipsRevolution.com to shop Cullins’ lipsticks and glosses. If you are in a domestic violence situation, assistance is available through SafeHaven of Tarrant County. Larry Pike, Mary Huggins and Minika Tharpe.